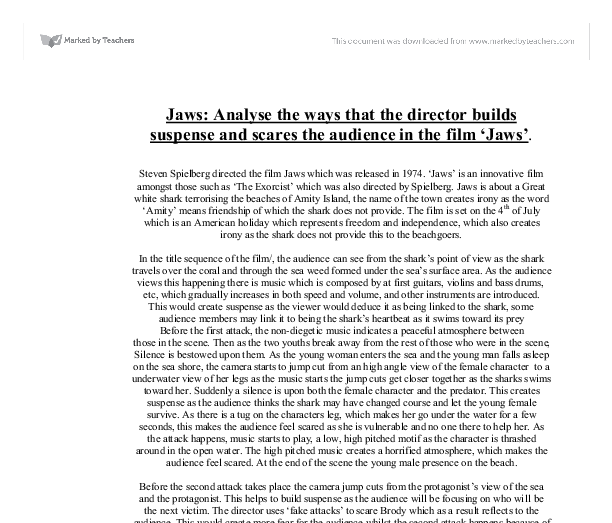 Jaws: Analyse the ways that the director builds suspense and scares the audience in the film 'Jaws'. Steven Spielberg directed the film Jaws which was released in 1974. 'Jaws' is an innovative film amongst those such as 'The Exorcist' which was also directed by Spielberg. Jaws is about a Great white shark terrorising the beaches of Amity Island, the name of the town creates irony as the word 'Amity' means friendship of which the shark does not provide. The film is set on the 4th of July which is an American holiday which represents freedom and independence, which also creates irony as the shark does not provide this to the beachgoers. In the title sequence of the film/, the audience can see from the shark's point of view as the shark travels over the coral and through the sea weed formed under the sea's surface area. As the audience views this happening there is music which is composed by at first guitars, violins and bass drums, etc, which gradually increases in both speed and volume, and other instruments are introduced. This would create suspense as the viewer would deduce it as being linked to the shark, some audience members may link it to being the shark's heartbeat as it swims toward its prey Before the first attack, the non-diegetic music indicates a peaceful atmosphere between those in the scene. ...read more. Spielberg uses the music so there are different moods set amongst those in each scene, which as a result sends those moods to the audience. When the 'shark music' is played, the audience become scared and start to wonder about who the next victim shall be. The radio on the beach indicates a happy atmosphere, but the various jump cuts in the scene make the audience think about who the next victim shall be. The director uses also various things to show what damages it can do, such as the book of sharks, which Brody is reading to gain information on sharks, and when Hooper and Quint are talking about there various different encounters with sharks and the scares they have gained would make the audience feel petrified of sharks. This creates suspense as the audience would be more scared of the shark. Tension is created through out the film, through such things as fear of the unknown; the director creates this by not letting the audience view the shark for over an hour of the film. Spielberg also creates fear through this technique because he has not used a mythical character but a real type of monster. 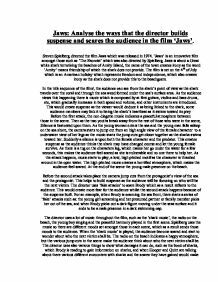 The director creates tension by having the first and second attacks close together to keep the audiences focus on the shark and to keep the fear of the shark within the audience's minds. ...read more. As the boat starts to go under the water the shark boards the 'Ochre' the boat starts to tip a Quint slips and starts to kick the shark and as he cannot stay up on board any more Quint slips into the mouth of the shark, this would create fear amongst those in audience as the blood starts to raise into the characters mouth. Before the shark is killed there is a definite form of fear between those in the audience as they will be fearing for the life of Brody and as the gas cylinder falls into the sharks mouth and shot by Brody, this would create a quick shock of horror as the audience would have been expecting something different from the characters, but the tension built created a perfect end for those in the scene of whom were left and as Hooper appears from the depths of the water tension is released as the two friends are reunited. In my opinion of the film the scariest moment was when the shark was obliterated because of the tension built from the non-diegetic music and the features of those in the scene and the end was un-expected from those in the audience. Although the tension was built up for that ending the various parts that built up the tension were also scary such as when the shark tried to attack Hooper and when the attack on Quint took place. ...read more. Spielberg highlights dramatic irony through Schindler's character. Early on in the film Schindler says that he will be remembered for been a successful businessman and earning "steamer trunks" full of money. But he ends up been remembered for sacrificing his money to save the lives of 1100 Jews through whom he was planning to earn the money. They are quick to knock the sandwich out of his hand. This action, rudimentary as it may be, suggests that Derek is not there for the same reasons as the others. He is looking for fun too, but his version of fun is very different. Spielberg continues to use the contrast in lighting, as well as using silhouettes as they are dark and threatening, making us feel on edge. Spielberg isolates the girl, making the boy useless and drunk, so we understand she is totally alone. We see the children's legs underneath the water, and then we see the shark go in to attack. The camera gets closer and closer to the legs, until we think that they can't get any closer, and then we see the attack in the distance. Suddenly the camera shot dips under the water, the dramatic music from the title sequence begins. The audience can see Chrissie swimming, as the music continues getting faster the sharks presence is made known to the audience. As the shark approaches her - her legs are dangling downwards under the water. After the attack and the disturbing music the 'dead' silence came. This is to highlight the fact that the girl has been killed in a very brutal and painful way and that nobody could help her, even if they wanted to.